Suitable for just about anywhere that would benefit from proper litter disposal. As with most concrete products, durability is a top feature of these 22 gallon square concrete trash receptacles. The natural weight of the concrete construction helps ensure the receptacle will not grow legs and walk off by itself. The lid is secured to the trash receptacle with a vinyl coated security cable. 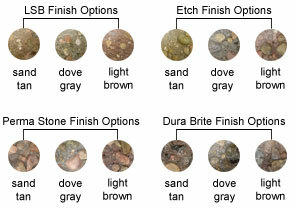 The lid is available in its natural spun aluminum finish or can be powder-coated with any of the colors as shown. 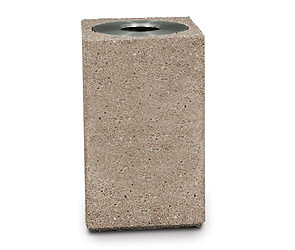 This octagon precast concrete trash receptacle is available in Light Sand Blast, Etch, Perma Stone, and Dura Brite finish options, and is treated with a water-repellent sealer for ultimate weather resistant durability.